Wow! There were over 300 entries in last week's Word Art Wednesday challenge!! That is fantastic. I would love it if one of my blog readers was one of the winners. That would be great!! 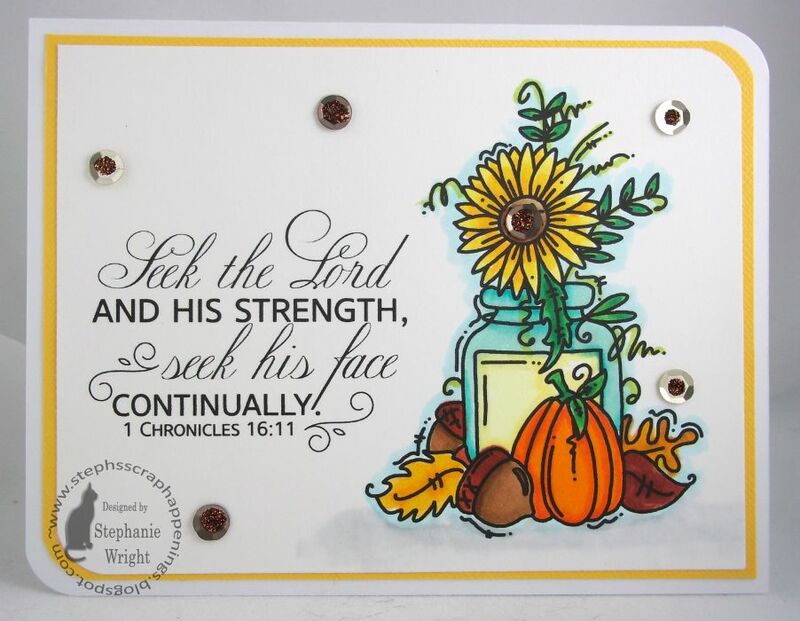 This week's focus verse is 1 Chronicles 16:11, "Seek the Lord and His strength, seek His face continually." I don't know what the last few weeks have been like for you, but ours have been a whirlwind. At my mother-in-law's suggestion, we're going to buy a house with her and have been going through the house-buying process (a first ever for us), we've had family illness, a work promotion and transition for my husband, and various other normal life odds and ends. Whew! We have definitely needed the Lord's strength and have been asking for His wisdom. I am so thankful that we can go to Him, the source of all wisdom, when we don't know what we should do. When we're tired and discouraged, He is there with His strength to uphold us and encourage us. As I look back over the last 5 weeks, I am so thankful again for the Lord and all He does for us. I tried making a truly CAS card this week. I just couldn't bring myself to make it only one layer...I just had to add a mat (one of my friends teasingly refers to me as the "Mat Queen" because I feel the need to mat almost everything). However, I did settle for just one mat, a few sequins and some stickles for the interior of the sequins. This beautiful Autumn Jar image is from one of our awesome sponsors, Bugaboo Stamps. It was so fun to color with my Copics. I tried a new (to me) paper for my coloring this time. It's Neenah Bright White (bought at Walmart). Definitely not the same as Neenah Solar White. It's OK but I think it bleeds a little more than Georgia Pacific (also bought at Walmart) and definitely more than Neenah Solar White or Papertry Ink White Cardstock. I'll still use it as a basic white cardstock and will probably try it again with more Copic coloring for further testing, but so far it's not in my Top 3 Favorite Papers for Copics. I so appreciate you stopping by for a visit today! Please don't forget to pic up your free digi and see if you were one of the winners from last week's challenge over on the Word Art Wednesday blog. Your card is beautiful with this autum image and it,s a great CAS card. Beautiful card. Love the image and the verse. Thanks for sharing with us at SBC this month. Love the flower vase surrounded by the pumpkins and the wonderful verse you included. Thanks for playing at the Mod Squad Challenge this week and good luck. This one is really beautiful, Stephanie! Such a wonderful Scripture verse too! Beautiful card! Thanks for playing with us at Craft Your Passion#279.Good luck. Congratulations on being one of our top picks for the Scrapbook Blessings Club September Challenge. You made this challenge a huge success this month and we thank you. You can grab the top 3 button on the winners post. Our new challenge is up and running, hope to see you again. 200th Challenge Celebration = LOTS of Prizes!!! !